Not to be confused with cytosine, cysteine, cytisine, or cytidine. 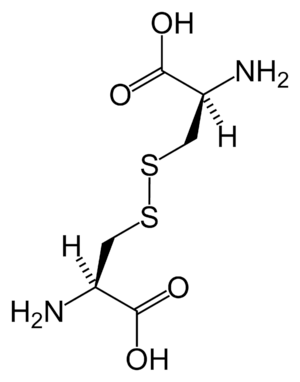 Cystine is the oxidized dimer form of the amino acid cysteine and has formula (SCH2CH(NH2)CO2H)2. It is a white solid that is slightly soluble in water. It serves two biological functions, a site of redox reactions and a mechanical linkage that allows proteins to retain their 3-dimensional structure. It is common in many foods such as eggs, meat, dairy products, and whole grains as well as skin, horns and hair. It was not recognized as being derived of proteins until it was isolated from the horn of a cow in 1899. Human hair and skin contain approximately 10–14% cystine by mass. It was discovered in 1810 by William Hyde Wollaston. Because of the facility of the thiol-disulfide exchange, the nutritional benefits and sources of cystine are identical to those for the more-common cysteine. Disulfide bonds cleave more rapidly at higher temperatures. The presence of cystine in urine is often indicative of amino acid reabsorption defects. Cystinuria has been reported to occur in dogs. In humans the excretion of high levels of cystine crystals can be indicative of cystinosis, a rare genetic disease. Cysteine supplements are sometimes marketed as anti-aging products with claims of improved skin elasticity. Cysteine is more easily absorbed by the body than cystine, so most supplements contain cysteine rather than cystine. N-acetyl-cysteine (NAC) is better absorbed than other cysteine or cystine supplements. ↑ M.A. Aslaksena; O.H. Romarheima; T. Storebakkena; A. Skrede (28 June 2006). "Evaluation of content and digestibility of disulfide bonds and free thiols in unextruded and extruded diets containing fish meal and soybean protein sources". Animal Feed Science and Technology. 128 (3–4): 320–330. doi:10.1016/j.anifeedsci.2005.11.008. ↑ Gahl, William A.; Thoene, Jess G.; Schneider, Jerry A. (2002). "Cystinosis". New England Journal of Medicine. 347 (2): 111–121. doi:10.1056/NEJMra020552. ISSN 0028-4793. PMID 12110740.